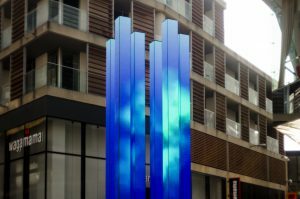 The Workers were commissioned to create a new digital artwork called ‘Ambient’ for the seven meter tall digital totems at Leicester’s Highcross by Studio for Cinematic Architecture and, retail developer, Hammerson. 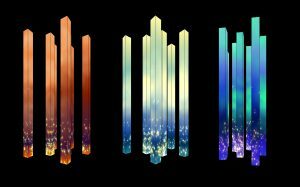 The ‘Ambient’ artwork is the only long term commission to be played on the totems — known as the Highcross Lanterns — for their entire lifetime. The Workers desired to created an artwork that evolves minute by minute as well as over the seasons and years to make the sculpture an everyday experience for the people of Leicester. 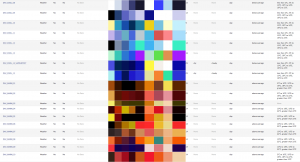 Hundreds of colour palettes can be generated for the piece. Each palette reflects different weather conditions, times of day, as well as special events. These events include ‘golden hours’; a time calculated each day where the sun will sit less than 6° above the horizon and dramatic sky-scapes can appear. Within a specific temperature range? Hot as it gets? Gone below freezing? The client can also schedule ‘special event’ colour palettes via a remote CMS. For example, as the cities revellers celebrated Leicester City Football Club’s win of the English Premier League in the surrounding bars & restaurants the client triggered the team’s colours. The totems, designed by Studio for Cinematic Architecture and Levitate, have a unique structure where the LED faces wrap around the structure. From any viewpoint two perpendicular faces can be seen. 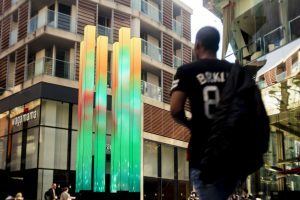 The goal of the ‘Ambient’ commission was to emphasise this unique volumetric nature. A three dimensional ‘virtual vapour’ system was created which responds to the current wind direction, speed and cloud cover. As this ‘virtual vapour’ passes over, and intersects with the sculpture, the LEDs light up. This creates a true three dimensional effect for the viewer where volumes of light traverse through the sculpture. Bubbling at the bottom of the sculpture is the spark system, near frozen in time. As people approach the sculpture, time warps and particles speed up. As children play near the structure the sparks shoot up the 7 meters to the top. The sparks ‘virtually’ fly through each of the totems only becoming visible when inside a totem, further emphasising the three dimensional nature of the sculpture and its height.